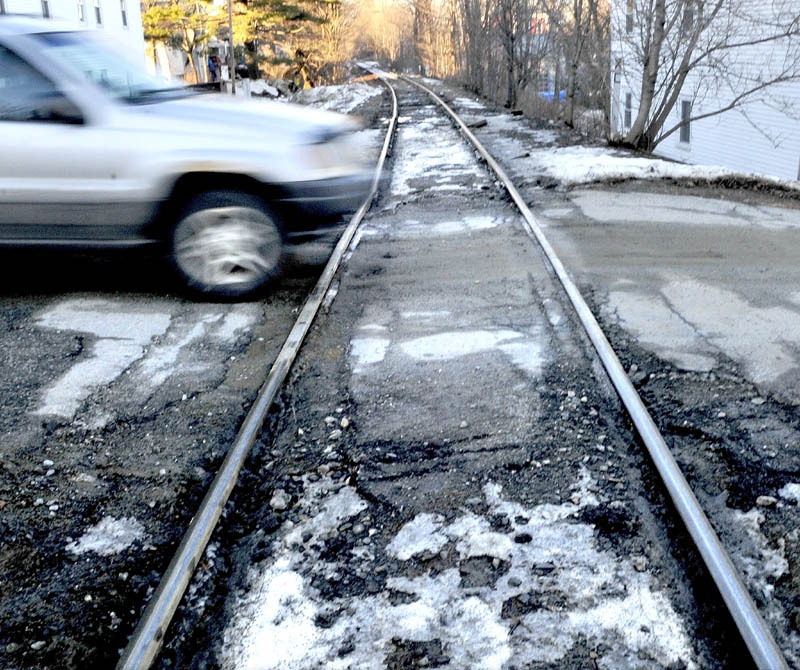 Fairfield's Board of Selectmen has recommended closing railroad crossings on Willow and Elm streets, to facilitate renovation of the town's remaining railroad crossings on Burrill Street, Lawrence Avenue, Summit Street and Western Avenue. FAIRFIELD — The town is considering closing two railroad crossings, which would leverage federal and state funding to fix up four other crossings in town. The closure of a railroad crossing is a rare thing. A motorist drives over a rough railroad crossing on Elm Street in Fairfield on Jan. 14. 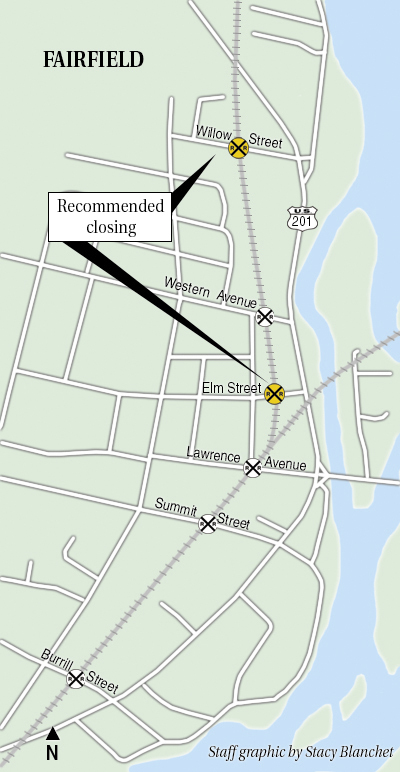 Selectmen have recommended closing the Elm and Willow streets railroad crossings, to facilitate repairs on crossings at Burrill Street, Lawrence Avenue, Summit Street and Western Avenue. Of Maine’s roughly 800 crossings, only two have been closed in the past five years, according to Nate Moulton, director of the Maine Department of Transportation Rail Program. Fairfield’s Board of Selectmen recommended closing crossings on Willow and Elm streets earlier this month, after a public hearing. Deputy Town Manager Cynthia Tuttle said that those two crossings were chosen in part because they lacked markers and signals, which would have made upgrading them more expensive. They also have low levels of traffic relative to the town’s other crossings, she said. Closing those two crossings will allow for the total renovation of the town’s remaining railroad crossings on Burrill Street, Lawrence Avenue, Summit Street and Western Avenue, all of which have deteriorated badly. “This is such a good chance for the town to address a situation that has always been bad,” Tuttle said. Because each railroad crossing carries with it a risk of accidents, the federal government provides grants to help fund crossing closures. The government’s view, Moulton said, is that “the safest crossing is no crossing,” because they eliminate the chance of collisions. “Once it’s closed, we can kind of agree you will never have an incident between a car and a train there,” he said. While the federal government is pushing for closures, Moulton said, it is hard to identify ones that make sense for local communities. Fairfield is ideal for closures, Moulton said, because of a network of streets that run parallel to the railroad and across it in multiple places. Moulton said that the cost to renovate the town’s four railroad crossings, in addition to a possible fifth crossing on U.S. Route 201, would be somewhere around $900,000. He said that “the bulk of it” should be paid for by the federal railroad safety program with the state being responsible for any additional costs. Federal guidelines may require that the town contribute a small amount of matching resources, Moulton said, but that requirement could be met by providing services, such as traffic detours, that would bring the overall cost of the project down. The goal, he said, would be to have no cash outlay from the town, a shift from a couple of months ago, when Moulton said out-of-pocket project costs would have to be negotiated between the town and the state. Pan Am Railways has agreed to upgrade the railroad tracks themselves in conjunction with the projects, Moulton said. Moulton said that, if all goes smoothly, the crossing upgrades will happen sometime this year, although new signals won’t be installed until 2014. The new pavement should last 10 to 12 years, Moulton estimated. Moulton said that the closings and the renovations will have to be submitted to Maine Department of Transportation Commissioner David Bernhardt for approval before they can move forward. The state will hold its own public hearing on the closings at the Fairfield community center, but the date has not yet been set.